The declaration of war in 1917 and the attack on Pearl Harbor by the Japanese on December 7, 1941, stirred the men and women of Kane County, Illinois, to action and service. 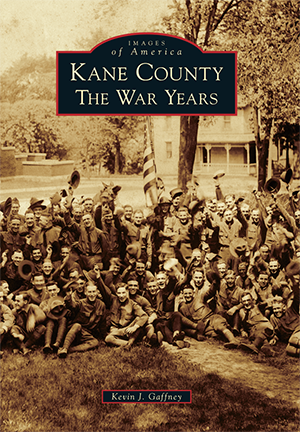 Come and hear local Author Kevin J. Gaffney talk about his new book and the stories that inspired him to write "Kane County the War Years". Kevin J. Gaffney, 60, was born and raised in St. Charles, Illinois. Kevin’s interest in military history began at an early age, as many members of his family, including his Dad, Charles, Grandfather Joseph C. Gaffney, and many uncles served in both WWI and WWII. He received his BA in political science in 1981 from Stetson University located in Deland, Florida. In 1996 he received his MPA in public administration from the Illinois Institute of Technology in Chicago. He has taught history and government in Christian schools in Delaware and in Florida. He formerly taught criminology as an adjunct professor at Judson University in Elgin, Illinois. His past employment also included working in the Criminal Unit, U.S. Attorney’s Office in Chicago and with the Commodity Futures Enforcement Division in Washington, D.C. He currently works for the Office of Chief Counsel, U.S. Department of Veterans Affairs, at Hines VAH, Illinois. Kevin also has served as president and board member on the St. Charles History Museum and also as president of the St. Charles Park Foundation. He enjoys serving and volunteering for many not for profits and religious organizations both locally and nationally. When not writing, Kevin also professionally recorded two CD’s of trumpet Christian and patriotic music with his version of the Star Spangled Banner being published by Sony Music. He and his daughter Kacie, also annually honor Veterans with the playing of taps on Veteran’s Day and Memorial Day in St. Charles. He also enjoys playing many sports, including golf with his family and friends. He hopes that the book will keep alive the memories of many men and women who valiantly served in the military and who assisted in many ways both domestically and abroad to gain the ultimate victories for the Allies and America in both wars. Thank you for signing up for our Saturday Speakers Series: Kane County the War Years. Please arrive 10-15 minutes prior to the program to check-in. Cash, credit and check are accepted.